Are Apples Good for High Blood Pressure & Cholesterol? If you're trying to lower your blood pressure and improve your cholesterol numbers, eating apples may help. They provide cholesterol-lowering insoluble fiber, digestion-boosting soluble fiber, healthy sugars and phytonutrients that all work together to benefit your heart. Low in calories, apples can also help you keep your weight down, reducing your risk of cardiovascular problems. Maintaining a healthy weight is important for keeping your blood pressure at a safe level. Eating apples can help you lose weight or maintain your current weight. Each medium apple, with no fat and only 95 calories, gives you 4 grams of fiber, which provides bulk and keeps you feeling full longer. 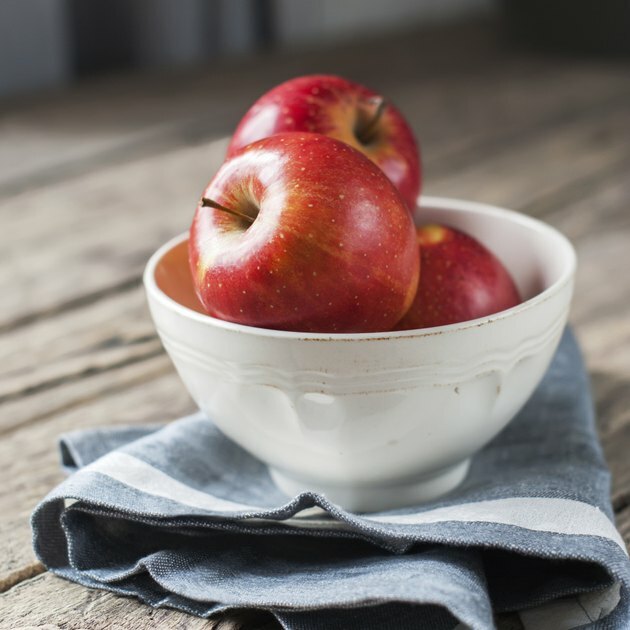 Apples contain both soluble and insoluble fiber, providing roughage that speeds up your digestion, along with the cholesterol-lowering benefits of soluble fiber. A higher blood concentration of uric acid has antioxidant effects that help your body fight off free radicals. Higher plasma uric acid may, therefore, lower your risk for some chronic cardiovascular conditions, including high blood pressure and cholesterol. Apples contain no uric acid, but the natural sugar in an apple still may increase the uric acid in your blood, according to Silvina Lotito of the Linus Pauling Institute. When you eat an apple, your liver rapidly metabolizes its fructose, stimulating production of uric acid and increasing antioxidant activity in your body. Apple consumption has a clear association with a reduced risk of cardiovascular conditions, according to authors of an article published in "American Journal of Clinical Nutrition" in 2003. The article provides results of the Women's Health Study, which surveyed nearly 40,000 women and examined the association between flavonoids, or plant-based pigments with antioxidant capabilities, and cardiovascular disease. Researchers found that apple intake was associated with reductions in the risk of both cardiovascular disease and cardiovascular events. In fact, women who regularly ate apples had a 13- to 22-percent decrease in cardiovascular disease risk. When you snack on an apple, don't peel it. Aside from having both types of fiber, the combination of an apple's pectin works with the phenolics in its skin to lower your plasma cholesterol and triglycerides. It also helps your body absorb cholesterol more effectively. Higher absorption leaves less cholesterol to accumulate in your arteries. This is why eating whole fruit can be more beneficial than eating processed fruit products or taking fruit extract supplements. What Are the Benefits From Eating an Apple? When Juicing an Apple Do You Leave the Skin on?